The TV ad showed character Dash from the Incredibles dashing (pun intended) around the house saying that the service had been boosted and that they could connect everywhere, even the roof. And it was superfast in the kitchen. The final voiceover said “Sky broadband, incredible wi-fi around your home”. 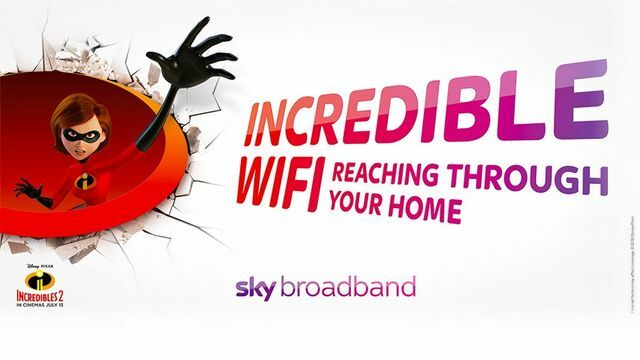 The press ad continued the Incredibles theme and contained the text “incredible wifi reaching through your home”. Both Virgin and BT challenged the TV ad on the basis that the “boosted claim” was misleading and could not be substantiated. Virgin challenged both ads because they said the ads implied that consumers could obtain consistent wifi everywhere in and around their home. They also challenged the clam “superfast in the kitchen”. The ASA agreed with Virgin and BT on the first point and said that the TV ad suggested that changed had been made to the actual broadband service (rather than changes made inside the property by the Tech Team). However, the ASA rejected the other complaints. It said that while the Wi-Fi signal strength and speed may have been enhanced overall, it did not mean that signal strength and speed woud be the same everywhere and would still differ in strength in different parts of the house. The ASA also considered that consumers would generally be aware that speeds would vary around the house and that in general, the further you were away from the router, the more the speeds would drop. The ASA also rejected the argument that “incredible wifi” was an objective one about the power and reach of the signal strength and speed. In addition, the ASA said that “superfast” meant faster than standard but did not guarantee to be available in every household kitchen. The competitors had not disputed that the Fibre services provided superfast speeds. While part of the complaint was upheld, the ASA took a pragmatic view of the “incredible” and “superfast” claims within the context of the ads. Sometimes we criticise the ASA for a lack of sense of humour, or taking claims out of context, so it is good to see an example of where they haven’t done that. The case is also a timely reminder for advertisers about the guidance on broadband speed claims and making sure that you comply with it. BT and Virgin objected saying the claim to have “Boosted your Sky Wi-Fi” was misleading. Virgin said the ads were misleading because they believed the ads implied that consumers could obtain consistent Wi-Fi everywhere in and around their home; and challenged whether the claim that broadband was “Superfast in the kitchen” could be substantiated. Sky said the ad made clear that adjustments to the service would need to be made and that customers would understand the term boosted. They pointed to on-screen text which stated “Additional kit may be required”. The broadcaster’s technical team had explained to the ASA the nature of the technology upgrade. They also provided case studies explaining how individual customers had been helped.